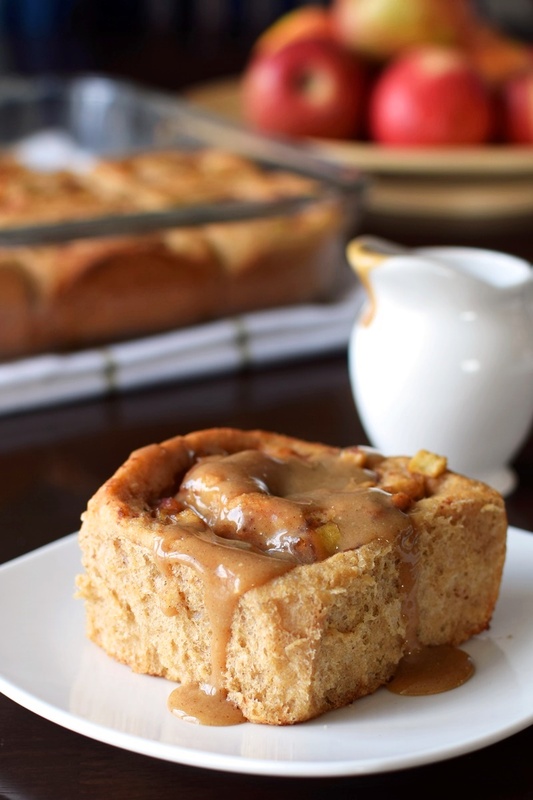 Healthy Apple Cinnamon Rolls: A Breakfast-Worthy Recipe! Holidays often mean an onslaught of heavy, sugary eats. I could spend hours in the kitchen trying to develop dairy-free replicates, but why? I’d much rather celebrate by getting creative with recipes that leave me feeling energized. That said, I crave carbs in the morning, and wanted something nutritious but seasonal to enjoy. 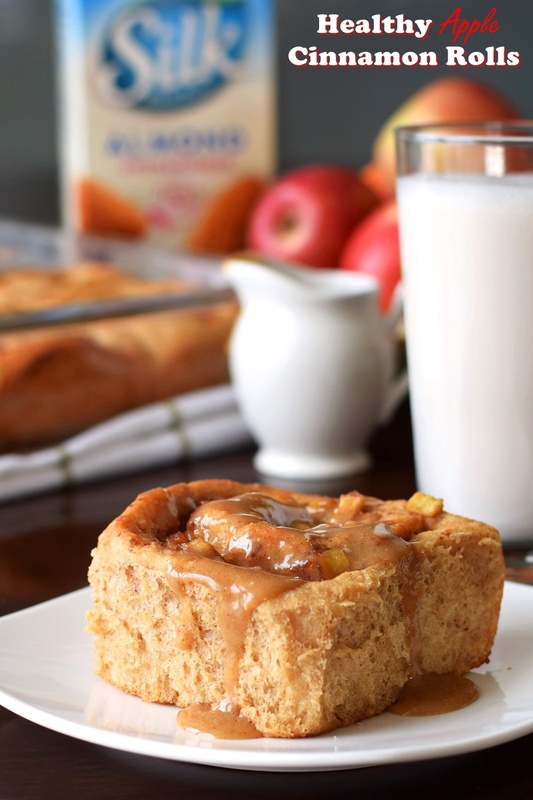 These healthy apple cinnamon rolls hit the mark. They’re naturally sweetened, whole grain, breakfast-worthy, soft, tender and delicious. They’re not as sugary or fluffy as store-bought, but they are full-flavored and satisfying! This healthy apple cinnamon rolls post is sponsored by Silk, but the opinions, tips, photos, and recipe are all mine. Do you like coupons as much as I do? Sign up for their newsletter. Silk often emails about printable coupons for their products. Also, discover more great recipes & lifestyle tips on social media with the hashtag #DoPlants. Cinnamon rolls are yeast-based breads, which can perform beautifully if you know what you’re working with. I’ve got some notes to help trouble-shoot and maximize your delicious results. On almost every yeast-based recipe, you’ll see a review stating “mine didn’t rise!” This is rarely a problem with the recipe, but rather an issue with dead yeast. The second step in this recipe is “proofing” the yeast. It should foam a bit if active. If it doesn’t, you may be dealing with inactive yeast, and may need to get some new stuff. Also, you want your dairy-free milk beverage to be quite warm, to activate the yeast, but not hot, which can kill the yeast. This is how boisterous my healthy apple cinnamon rolls are on the second rising with active yeast. Whole wheat flour is more dense than all-purpose, but you can combat this by adding gluten, also known as vital wheat gluten. This extra dose of gluten helps to make the dough more elastic, improving the rise and tenderness of the dough. The kneading process also helps to “develop” the gluten. You might notice as your kneading that the dough becomes more workable. If you can’t locate gluten, then you will want to use part all-purpose or bread flour for the best results. I haven’t yet tried this recipe with gluten-free flours. Let us know in the comments if you do give it a go! Just yesterday, a friend was in shock that I don’t use small appliances when baking bread. I find it easier to make it by hand than to wash all of that equipment! Plus, it’s fun and relatively easy. If you prefer, you can use a stand mixer (with the paddle attachment) or a bread machine to aid in the kneading. 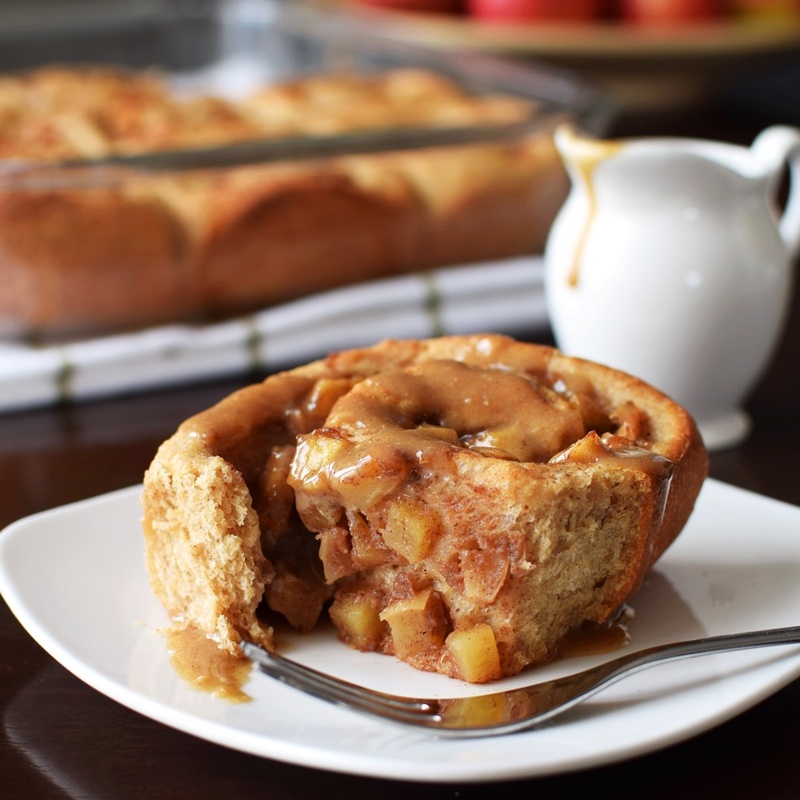 Though I sometimes eat them as is, my favorite way to enjoy these healthy apple cinnamon rolls is with a slathering of warm nut or seed butter. It’s a not-too-sweet breakfast that satisfies my morning carb cravings. But you can also thin nut or seed butter with a little maple syrup and milk beverage and drizzle it on like I’ve done in these pictures. If you’re in the mood for a sweeter treat, go with my sweet maple glaze. By ingredients, this recipe is dairy-free / non-dairy, egg-free, peanut-free, soy-free, vegan, plant-based, and vegetarian. For nut-free apple cinnamon rolls, use a tree nut-free milk beverage like coconut milk beverage or soymilk. Please note that the Prep time does not include the two rising times. Cinnamon rolls may look daunting, but the steps are quite simple and this recipe makes enough to enjoy for breakfast throughout the week! 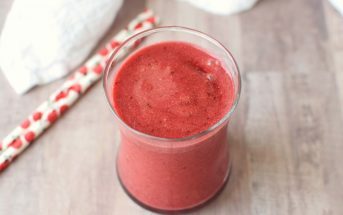 Place the warm milk beverage and 2 of the pitted dates in your blender and blend until the dates are mostly pureed. Add the milk beverage mixture and the yeast to a large bowl. Let proof for 5 to 10 minutes. In a small bowl, whisk 1 cup of the flour with the gluten, 1 teaspoon of the cinnamon, and salt. Add this flour mixture to the large bowl with the yeast mixture, along with the applesauce and oil. Stir to thoroughly combine. Gradually add the remaining 2 cups of flour, bringing it together with your hands as it gets doughy. Continue to knead the dough for about 7 to 8 minutes, sprinkling on more flour as needed to prevent sticking. The dough should be a little tacky, but shouldn't stick to your hands. Cover, place in your cold oven with the light turned on, and let the dough rise for about 45 minutes, or until roughly doubled in size. While the dough rises, place the water in your blender with the remaining 6 dates (about ⅓ cup packed). Blend until smooth. Melt the buttery spread in a skillet over medium-low to medium heat. Add the apples and the remaining ¾ teaspoon cinnamon, and saute for 1 minute. Add the date mixture (get it all in there!) and cook, stirring often, until the apples are tender and the date sauce is quite sticky. You don't want any watery pools remaining. This takes about 5 minutes. Punch the dough down and let it rest for 5 minutes while you dust a work space with flour and grease a 9x13-inch or larger baking pan. Roll the dough out to a large rectangle, roughly 11x14 inches. Spread the apple mixture all over in a single layer, leaving a 1 inh margin on one of the long sides. Starting from the long side that is fully coated in the apple mixture, carefully roll the dough up. Because it is a chunky mixture, you aren't trying to roll it really tight. Roll it relatively close while lifting slightly as you roll to ensure it all gets in there. Seal the dough, and give it a roll to make sure it's good. Using a serrated knife, gently cut the roll into 12 slices. Carefully transfer the rolls, cut sides down, into your prepared baking pan. You can reshape them once there and press in any apple escapees, if needed. Cover and let rise in your oven with the light on for 45 minutes or until close to double in size. Remove the rolls from the oven, and preheat the oven to 375ºF. Once fully preheated, uncover the rolls and bake for about 25 minutes, or until lightly browned. Serve as is or use one of the topping ideas in the post above. Store any leftovers in the refrigerator (the flavors actually deepen overnight!) or individually wrap and freeze. *Date Alternative: You can sub coconut sugar or your granulated sugar of choice for the dates. Simply use 2 tablespoons in the dough in place of the 2 dates. 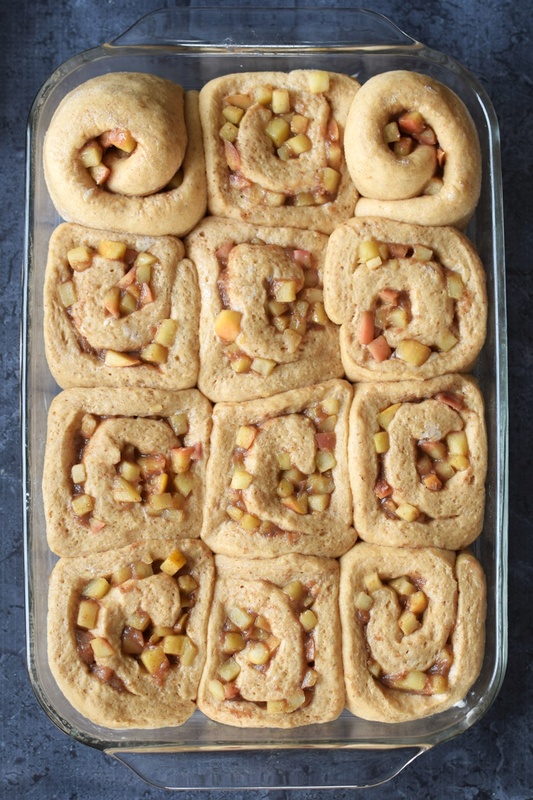 For the filling, saute the apples and cinnamon in the buttery spread, then spread on your rolled out dough. Sprinkle evenly with ⅓ cup of the sugar before rolling up. **Wheat Note + Gluten Alternative: White-wheat flour is actually 100% whole wheat flour, it's just a lighter grain than traditional "red" wheat flour. If you don't have access to gluten, swap all-purpose or bread flour for half of the wheat flour. ***Buttery Spread Alternative: If preferred, you can swap 2 tablespoons coconut oil for the buttery spread, but add a generous pinch of salt to the apples, too. They look awesome! I would love one for breakfast right now! Just had one for breakfast, mmm. They are SO good Mel, I promise, even from the freezer! I love cinnamon rolls, but they’re always too sugary, so I’m so happy to have a recipe that’s not loaded down with sugar. Thank you! I’ll take all the cinnamon rolls I can get! I LOVE them!! Such a doughy cinnamon goodness. I’m drooling! Oh my gosh, those look amazing! Especially with the sweet maple glaze, yum! These look so good! I’d love to have them for brunch. They’re a must to try any day! I’ve been eating them for breakfast with just nut butter on top – no added sugar but they hit that carb craving! Those look so yummy. I have been craving cinnamon rolls lately. I’m always craving cinnamon rolls! These look incredible, and hand kneading dough is so therapeutic and relaxing in my mind! Gorgeous. I knew you could appreciate that Karen! I absolutely love kneading by hand, too. I totally agree with you Alisa. I always make bread or yeast based goodies by hand. This looks like such a perfect Christmas brunch recipe and a bonus that it’S healthy. Aw, I love that tradition! You know, it tastes even better than I originally anticipated. Those flavors meld so beautifully. 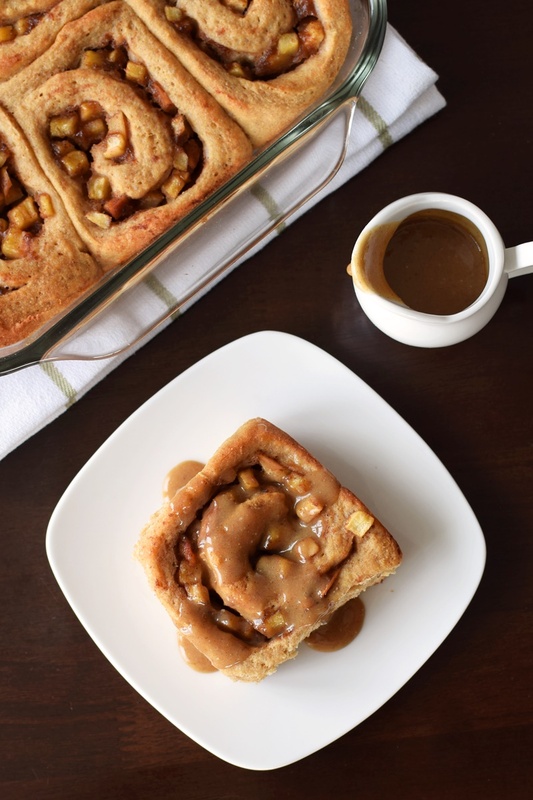 We love to make cinnamon rolls on Christmas morning – thanks for a dairy free version! I made cinnamon rolls for Christmas every year, I think I’ll have to try apple cinnamon rolls this year! You should, so yummy! They’re a little messier, and you may want to eat with a fork, but they can be eaten by hand! These look so good Alisa! My husband is the bread maker and makes the cinnamon and caramel rolls. They take him hours and they are always so good. Although lately he has been trying different recipes at my request. My oldest requested red velvet cinnamon rolls again for her birthday sleepover this weekend but since she (and all her friends) also requested homemade pizza I think she will go with her second option of a waffle bar. I’m saving this recipe and might try to make them myself next weekend before the hubby flies back so we can enjoy them while getting or decorating our Christmas tree. Otherwise new years morning! I love that you have such a baking household Sarah, and that your husband does it! Like him, bread baking has always been my favorite thing to do in the kitchen, and the holidays give me more of an excuse to enjoy it! I hope you do get the chance to enjoy this healthy version – they’re great for any morning (I’m having them for breakfast today!). Wow, I wish I grew up in your household Kristen! Thanks, and I hope you do get the chance to trial! These look so amazing! All of those delicious apples in there make these absolutely gorgeous! I think so! Thanks so much Rebecca! Hey Kat, in some ways they seem like a lot of work, but in some ways they’re really easy and rewarding. It’s more patience than anything else – I usually use the rising times to clean on the weekends! GOSH to say these look amazing in an understatement!!! WOWEE. These would make a crowd-pleasing breakfast on Christmas morning for sure! These looks absolutely fabulous! I think I would enjoy these with a big cup of coffee and a nice magazine- the perfect R&R for the holidays! I do my best 🙂 I like sweets that I can eat whenever I want!